Uglyworld #315 - Babo's Masterplan Unfolds (30-365), originally uploaded by www.bazpics.com. This morning Babo was up before everyone else carefully going over his masterplan to bring Wage back to normal. He quickly and quietly woke up Ice-Bat (who caused the whole mess in the first place), Jeero and Wedgehead and ran them through his plan step-by-step. He informed them that they were key to the plan working along with a "secret weapon". 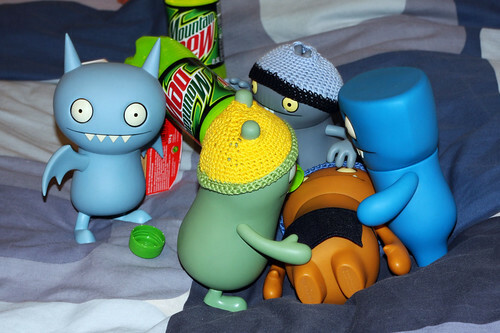 As they huddled outside the bedroom door Babo unveiled his secret weapon - 2 bottles of Mountain Dew, Jeero being the resident dummy thought that these were for him and said "thanks" to Babo while trying to grab one of the bottles. Thankfully Babo was fully awake and told Jeero to "shhhhh!" and then explained that he had worked out that the only way to cure Wage was to find a substitute for the Irn-Bru, and that after spending hours searching the internet he found that Mountain Dew was the perfect solution. I slowly turned the key in the bedroom door to open it up for them and checked that Wage was still sleeping, and the guys sneaked up to the bed and like a perfectly co-ordinated ninja assault they all grabbed Wage at the same time and held him down. Ice-Bat held up the first bottle of Mountain Dew so that Babo could open the lid and then they began to pour it into Wage's mouth. Wage wasn't taking this lightly and his arms and legs were being thrown about like a dozen socks on their own in a running washing machine, but the team stayed strong and worked together to keep him on his back to allow the drink to work it's magic.